Just got back from vacation pulling my 1995 Shadow Cruiser 21 foot fifth wheel with my 2002 Ford Ranger. It's a 4.0 SOHC, auto, 4wd, and has 4.10 gears. Only things I've done to it is basic maintainence (All Amsoil for lube), plus a Powertrax No Slip and has 245/75/16 Goodyear Duratracs. Truck did an awesome job. In the cold of WI we would only get 8 mpg or so, no matter if it was 65 or 70 mph we traveled. Once it warmed up, we would get 11 mpg at 65, very high 10's at 70. With the 4.10 gears it would put the truck just above the torque peak, holding speed very well on most hills. If it did lose speed, the transmission would hold its gear, and the cruise wouldn't kick off unless it lost more than 10 mph. I'm glad I found a small fifth wheel for my Ranger, as I think a bumper pull of my campers weight would be a much harder pull. The Shadow Cruiser has nice areodynamic front really helped out a lot. Total weight of the rig with a full tank of gas and both passengers was 9540 pounds, which is 40 pound over. However, I had a lot of extra stuff, including a generator, and a tool box in the truck. So weight is close to max otherwise, but the truck is more than capable of pulling it. We traveled over 4500 miles on the trip. The truck has over 150k miles on it. I only added half a quart of engine oil over the entire trip, which could just be from not making sure it was full when I changed the oil, as it didn't burn anymore the entire trip. Overall, very impressed with how well the truck did. Many people spend years trying to find a good pulling setup, and I feel I got it right on the first one. excellent! glad it worked so well for you. 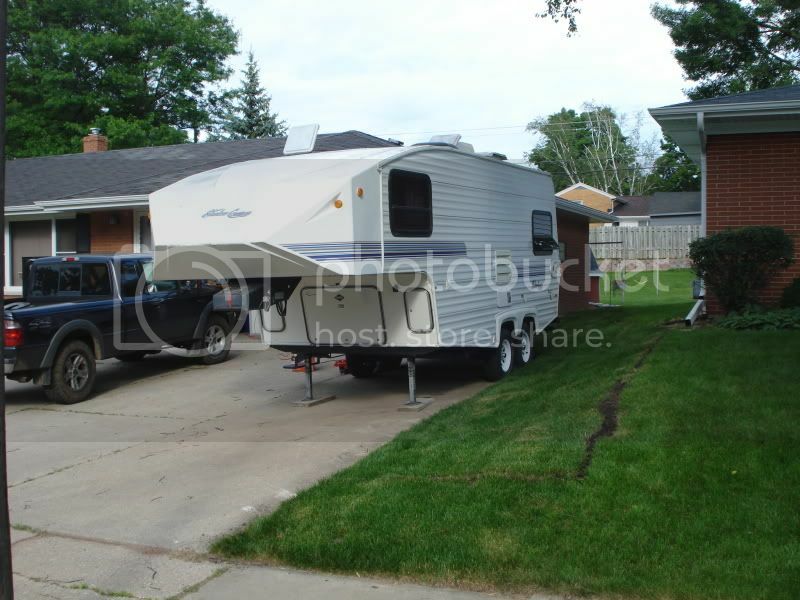 i plan on upgrading from my light weight tent camper to a bumper pull small camper trailer in a couple of years. hoping to keep the trailer weight under 2k. helps to know my truck shouldn't have too much trouble pulling it. Wow thats pretty good mileage for pulling! I only get 15 on the highway in my explorer, with the same setup, 4.0 auto 4.1s. What size tires do u run? Awesome to hear. Thats pretty decent for a small rig and a 5th wheel. thats a nice trailer. what i like about it is you still get a max space out of a minimum overall package and it is beautifully maneuverable. christ all mighty! 450 gallons of gas for a vacation is a LOT! hell, i would not be happy to have to put 450 liters into my truck! wow! very nice camper for sure! somehow, i thought it would be green and gold?! this was an inspirationtal post! I have to say, this was one of the posts that inspired me to get a 5th wheel for my truck, I also landed a 1994 shadow cruiser, this one is 24ft. the dry weight is only 3300lbs, which is impressive for that size. the GVWR is 4500lbs. Im currently in the process of rebuilding my truck box to support the hitch, as the floor at the front was rotted. I ended up changing 3 crossmembers. hopefully the camp rig will be rolling soon! yeah....7 years. glad it was inspirational. rotten frames a bummer though. I have a 1994 Ranger Splash Supercab with a 4.0 and an automatic trans. It came equipped with tow package and I found towing chart that says I can tow up to a 9500 GCWR. I have 174,000 on her, but she uses no oil, doesn't leak, runs great and is very comfortable to ride in and use. I don't know the difference in a Splash verses a regular ext, xlt, "If Any" the only thing I've had to do is redo my brakes, new rotors and calipers, and fuel pump and sending unit. Any thought out there about my doing this? I am truly thinking about getting a fifth wheel and going out this summer as Park Hosting. ?